From a single server to an enterprise environment incorporating the latest high-density computing technology, we can cater for virtually any hosting requirement you may have. Our Auckland Data Centre is exceptionally secure and reliable, providing the most robust environment to house your servers. Why buy and host your own server, then deal with the need to maintain and service it on site, then budget to replace it every few years... when you can host your applications on a hosted server in a secure data centre with automated power and data backups? We can provide customised hosting solutions to meet your needs; we can host your own equipment, or we can provide dedicated hosted servers as a service or virtual servers hosted on our infrastructure. You own your server, and we host it for you in our secure data centre - You gain the uptime and accessibility of data centre hosting, while still having the security of owning your own equipment. We supply a server to suit your needs, and host it in our data centre. 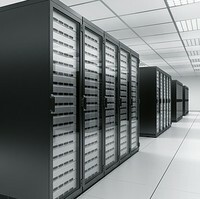 We own the server, and lease it to you for a monthly cost including hosting. We are responsible for maintenance and upkeep of the hardware. Business Continuity and Disaster Recovery are a pivotal aspect of risk management for any business critical system. Leveraging our online backup and Disaster Recovery services and our Virtual Private Server infrastructure, you can be up and running again in as little as minutes, in the event of a disaster affecting your IT systems. We create a virtual server for your use. This server is hosted on our virtualisation infrastructure, and all maintenance and upkeep of the hardware is our responsibility. You access and use the virtual server as you would a physical server. Because the server shares the resources of a physical machine, it is generally cheaper than an equivalent dedicated hosted server. Want to minimise PC hardware and support costs? For clients with 20 or more users, virtualising your desktops is a seriously attractive option. Your individual user environments are run on a server, sharing its greater resources and processing power; your users then work on low cost, minimal support devices such as thin clients, to access their virtual desktop and their work as normal. This approach minimises both capital investment and ongoing support costs, while delivering your users a stable, manageable, standardised operating environment. Hosting your desktop virtualisation solution in our data centre delivers maximum reliability and uptime, and greatly improves the speed and reliability of remote access for your mobile workforce, or staff telecommuting from home. Flexible customisable solutions - we will listen to your needs and build a custom solution to precisely fit your requirements. Part of a wider range of services - co-location or hosting can be integrated along with other components of our service stack to provide you with a complete end to end private cloud solution. Tight integration, exceptional interoperability, and a single point of contact means you can have confidence in the solution we build for you. Exceptional Reliability - N+1 redundant cooling and power systems, power supplies from separate substations, multiple uninterruptible power supplies (UPS) and generator backups, meaning we are able to guarantee an uptime of 99.99%. Connectivity redundancy - multiple feeds from fibre providers. Highly Secure - our Auckland Data Centre is manned 24×7, and also features fingerprint scanning (biometric) and proximity card entry technology, monitored Closed Circuit TV (CCTV) and individually locked racks. Superior Capability - the only New Zealand commercial Data Centre capable of supplying up to 30kW power and cooling per rack unassisted, allowing you to consolidate your servers if required. Green Friendly - this Data Centre’s chilled water system and high efficiency UPS allow us to host your servers efficiently.